Don’t know how to register a domain name? This tutorial will show you how to register a domain name. It will also tell you why it is better to pay for your domain name than to get it for free. To get a domain name, you need to register it with an organization called ICANN (Internet Corporation for Assigned Names and Numbers). You cannot buy a domain name directly from ICANN. ICANN doesn’t sell domain names at an individual level to everyone. Instead, you can buy it from a Domain Registrar. A Domain Registrar is a company accredited by ICANN to register domains. You can register a domain name with a Domain Registrar by paying a small amount, usually around $10. The registration is usually valid for a year and then you will have to renew the registration again. There are thousands of such Domain Registrars. The most popular are GoDaddy and Namecheap. I have used Namecheap a lot, and that is what I usually recommend to everyone. The cost of registering a domain for the first year is a bit high with Namecheap but the cost of renewing the domain registration in subsequent years is comparatively less. So in this tutorial, you will learn how to register your domain name with Namecheap. Go to Namecheap website and type the name of the domain you want to register in the search bar. 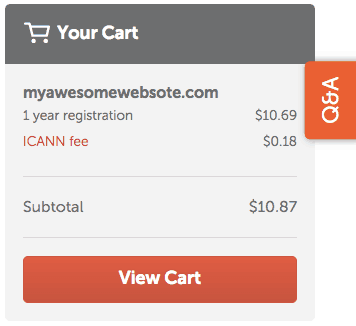 Namecheap will tell you if your domain name is available for purchase. If it is available, click the Add to Cart button. Now, on the right-hand side you will see that the domain is added to your cart. Click the View Cart button. You will then see the domain name in your Shopping Cart. By default the length of registration is One Year. Increase the number of years if you want to register your domain name for more years. It usually costs less to register the domain name for more years. Once you have selected the number of years, click the Confirm Order button. TIP: To save some money, search for domain registration coupons on the Monthly Coupons page on Namecheap site. 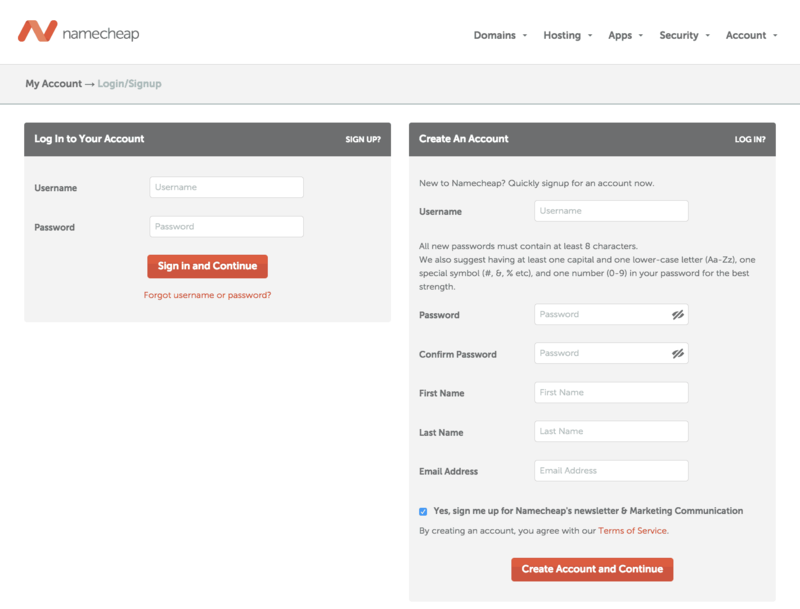 Once you click the Confirm Order button, you will be asked to create a new account with Namecheap or login to an existing one if you had previously created an account on Namecheap. If you are registering your first domain name with Namecheap, then most likely you will not have an account. Fill in your account and payment details to complete your purchase. Once the purchase is complete, your domain name will be registered in your name. You are now the official owner of your domain. 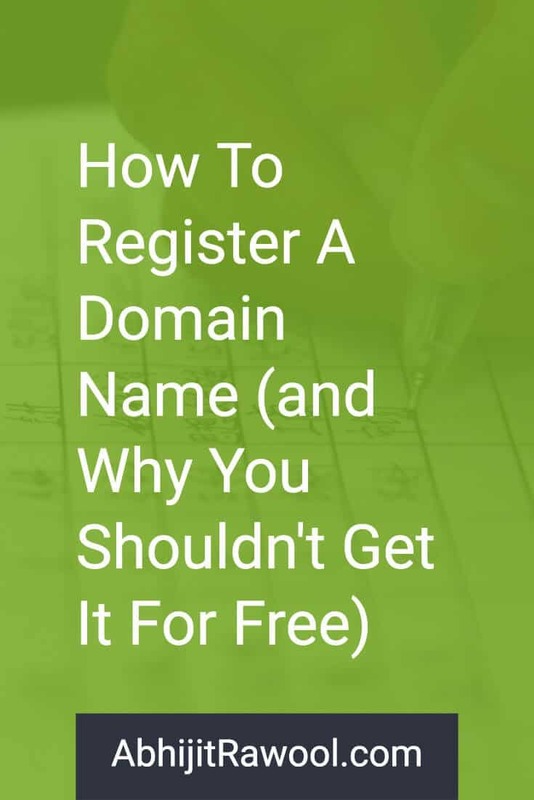 Now that you know how to register a domain name by paying some money to your domain registrar, let me show you how you can register your domain name for free and why you shouldn’t do it. There are many Web Hosting companies that will register a domain name for free if you buy their web hosting package. You will find many such companies with a quick search on Google. However, the problem is that these companies are more interested to sell you their hosting package which is usually a lot costlier than the domain itself. Also it means that, if in the future you want to shift your web hosting to some other company, your domain will still be at the old web hosting company and you might need to move that too. So it is better to register your domain name separately with a Domain Registrar and then point your domain to your web hosting. This way, if you move from one web host to another, you can simply point your domain to your new web host. By keeping your Domain Registrar and Web Host separate, you will essentially keep your eggs in different baskets which will reduce your risk. Now you know everything about how to register a domain name. Go and register your domain name with Namecheap. I hope you found this tutorial useful. If you need any help or have any questions, then let me know in the comments below.